It was only a few weeks ago when my friend brought the FNH USA SCAR into my radar. A great deal has been printed about it and the Internet boards are hopping with opinions, but it was sort of in the background for me. They were hard to get your hands on and many of the opinions were solicited. That is true with about anything now. It really boils down to that old adage about believing none of what you hear and about half of what you see. After 20 years as a cop, skepticism is about automatic. But, a recent contact with a local dealer also served to pique my interest a bit. Being a large seller of FNH USA products he had been able to acquire and shoot one. Pretty much everyone in the store raved about it, as did he. But it was my friend that really got me interested. A couple of years ago he started that long and arduous road towards a Green Beret. He recently had the opportunity to attend a transition course with the FNH USA SCAR as a part of his weapons specialist training and called me afterwards. He had a ton of good things to say about the system. Removing this rifle from the box the first thing you notice is how light it is. The data sheet says it weighs 7.25 pounds but it felt lighter to me. Placing it on a digital postal scale confirmed it weighed in at a bit under 7 pounds unloaded with magazine inserted. It is a testament to the balance. Next on the list are the sights. Often carbines come with no sights, or whatever system the manufacturer is getting the best deal on. They can range from very good to pretty stinking bad. These sights, however, are first rate. They are rugged, high quality and the front sight is a complete hood. 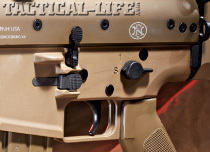 The rear sight has large and easy knobs for adjustment. There is also an indentation at the rear that will come clearly into play when adding optics becomes part of the mix. 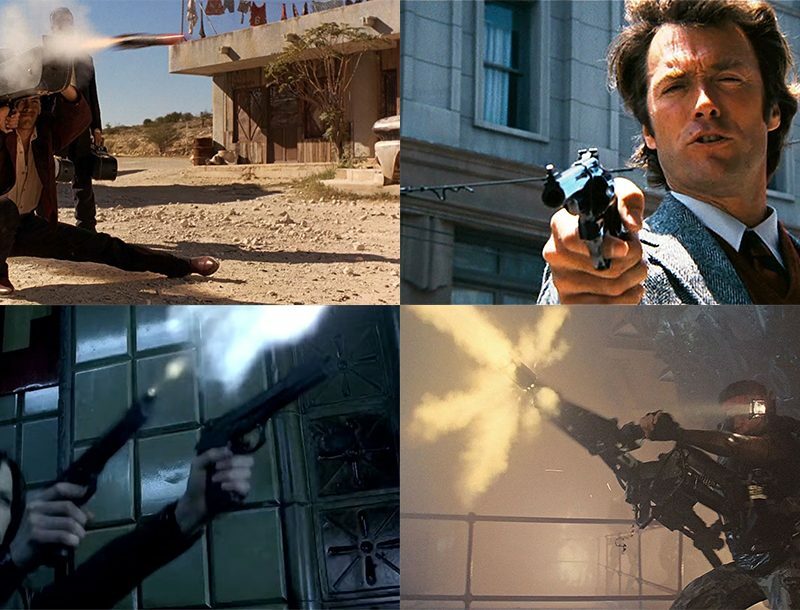 As you look further you see an ambidextrous safety and an ambidextrous magazine release. The bolt release is in the same location typically seen on an AR. The bolt knob can also change sides. One of the more irritating things about many guns is the need to purchase some form of sling attachment. With the SCAR there are attachments on both sides. 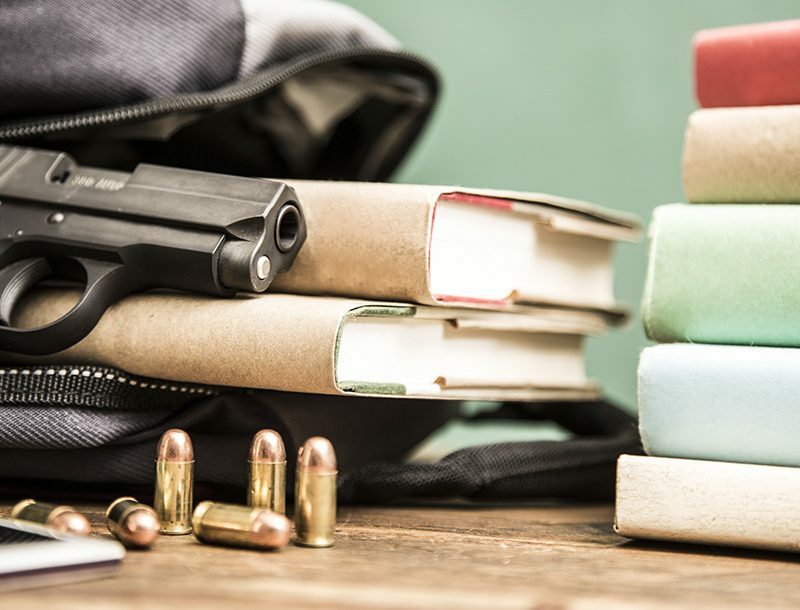 The safety and magazine release is where the standard AR systems are, so there is no re-training needed. The rifle has one long continuous Picatinny rail on the top that will accommodate any optics system you could use. It also has side rails to accommodate lasers and lighting systems. Right out of the box this rifle has everything you need minus your favorite sling and some more magazines. It is about as complete as you get. There are many features that make this rifle fit almost everyone. The stock both folds and extends. It does so with the push of a button in both cases. This allows for different sized officers, and accommodates body armor. As a folder it can be very handy for medics and breachers who need their hands free. Even with a 16-inch barrel it is handy when folded. 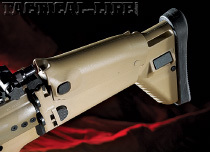 A standard AR pistol grip is used so an operator can change that to any of the dozen or so out there on the market. There is a larger “paddle” on one side of the safety that can be moved so left-handers can switch that around as well. The last little item is the “cheek rail.” You push a button and it moves up to accommodate a cheek weld for optics. If you had to remove them for some reason and go back to irons you simply push the button and you are perfectly indexed for the iron sights. The bottom line here is that someone put a ton of time into making this rifle accommodate as many people as possible right out of the box, and they did one heck of a job. To test the ergonomics I passed it around to about a dozen people. They included officers in uniform and those in plain clothes. My captain is 6 feet, 4 inches and built like a pro football linebacker. He grabbed it, made an adjustment or two and it fit him perfectly. The smallest was a woman, who was 5 feet, 2 inches and she did exactly the same thing. That is a pretty good testament to its versatility. I spent a good chunk of dry fire time both with my SWAT vest and in plainclothes. Again, it was very easy to adjust the rifle and it stayed exactly where I adjusted it. One of the more irritating things about the standard AR stock is shooting it from prone and taking a typical precision rifleman’s position. This means you place your hand under the rear of the stock. If you are not careful you trigger the release and it moves on the shot. That can be fixed with a stock change, but that is not an issue with this system. It stays where you put it and the button is pretty well protected. The same was true of the left side magazine release. While performing magazine changes and activating the bolt there was some concern this may be accidentally activated. That was simply not the case. The magazine release is well protected so you or your gear won’t hit it accidentally. While working corners and such, I kind of missed my 11-inch barrel, but that is just a personal preference. The 16.25-inch length is fine for both patrol work and entry work for sure. 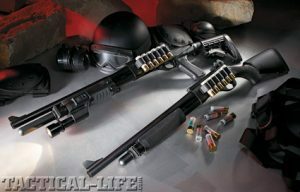 Besides, agencies can get the short barrel. There is no accommodation planned at this point to sell additional barrels to civilians or officers. Range time was a bit more focused with this rifle as it has been tested over and over for reliability. I truly had no thought it would not function. What I wanted to do was confirm its accuracy, as there are some pretty impressive claims out there for a carbine. The other task at hand was to try this rifle with optics. Running this rifle in a tactical vest is pretty natural. The sighting system is really easy to pick up and fast. It nestles into the shoulder very well and did not slide on my LBV (load bearing vest), SWAT vest or plainclothes. After putting several rounds through it at CQB (close quarter battle) distances I took aim at 100 yards and could pretty well tag the 8-inch round steel at will. Once I figured where to hold it was all up to me. Setting up a few malfunction drills served to highlight the advantages of a bolt operated from the side. 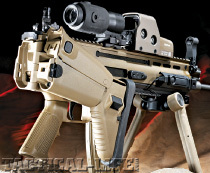 This weapon is incredibly easy to run while maintaining a solid position on target. Clearing induced double feeds and failures to eject was an cinch and there was never a need to come off the gun. All of the controls seem to be in the right place. It was time to add some glass. 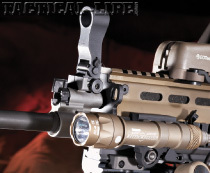 The US Optics SN4 has become a very popular 1 to 4-power optic. Having used one for years my preference is pretty clear. This optic is a 1 to 4-power with a “circle dot” reticle. It is the optic mounted on my deployment patrol carbine. While mounting the optic that indentation alluded to earlier became prominent. Many of the BUIS (back-up iron sights) out there simply do not accommodate optics well. They can be too high and often require you to move the optic forward and not where you would like it. Those that are flatter are often simpler not allowing for greater adjustment. With the SCAR that indentation allowed the mounting of this scope exactly where it was needed. After doing so the raising of the cheek piece provided for a solid cheek weld. Given the quality of the BUIS on this gun this would be all I would need, and it worked well. I had the US Optics SN4 scope on a quick disconnect mount, which only made sense because of the SCAR’s Mil-Std 1913 rails. For those of us who plan on using a quick disconnect mount, there are a few things you should note. Charging the gun while not paying attention may result in a scraped knuckle or two. That can be accommodated, and other mounting systems may provide more or less issues, but simply be aware when you mount your scope. There is no doubt this rifle is accurate, it pretty much shot everything under an inch. The rifle is designed around the 62-grain military round but it shoots other stuff just fine. It was fired pretty much as quickly as the target could be re-acquired. The measurement from center-to-center on the farthest holes was 1.25 inches and that was with practice ammo. If that is the worst this thing will do then it is about as good as it gets with a combat carbine. My friend tells me he was tagging the 600-yard targets pretty much at will with iron sights. 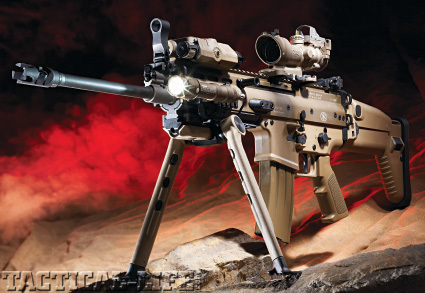 This rifle is accurate enough for government work and about anything else it needs to do. The longer you are in this business the less you believe the “hype.” This has become a market driven society and the marketing is not always in sync with reality. Then there is the $3000 price tag, which also puts most officers off a bit. So, I was pleasantly surprised that this rifle does everything it claims it can do. When you look at it closely even the price is not as far out of line as it appears. Right now, similar piston driven guns (other than AKs and the like) run around $2000. They can be much higher, but that is pretty much the norm. That generally does not include sights and at sling attachments. Most of the AR systems will not accommodate a folding stock either. Whether you or your department can afford it is a different story. For now and the near future there is no officer program, these are it. Once the American factory is up and running, those guns will only be available to the military but it will free up more imports for the civilian/officer market. They are available currently for police departments and government agencies. If I had the money I would pick one up in a heartbeat. Lucky for me that I am out of the realm of possibility so I can save myself the decision!